So what if this is the same: we are going through life, desiring more connections, a job promotion, more money in our bank account. Can random strangers become friends? Sometimes. Some people are meant to pass by for a second, some are meant to stay for eternity. 2. 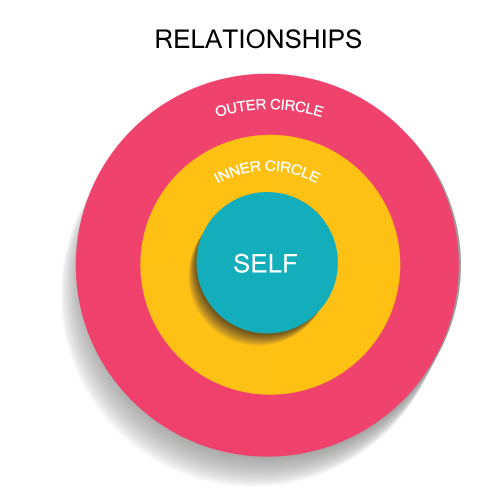 Inner circle: our family, friends, coworkers or people that we have almost daily interactions with. What does that interaction look like? Are we accepting and non-judgmental? Do we take things personally? One of my favorite books is “The four agreements” by Don Miguel Ruiz. I actually had the privilege of meeting his son, Don Jose. “Whatever happens around you, don’t take it personally… Nothing other people do is because of you. It is because of themselves,” – when I read this, something has shifted in me. I used to take on other people’s feelings or actions towards me, thinking it was personal. But looking at the bigger picture means staying true to yourself and just sending people love. They don’t mean to say hurtful things. When they do, it’s coming from a place of pain or anger, or hurt. It’s not personal. Think about these people and forgive them. 3. Self – This is probably the trickiest relationship of them all. We barely take time to truly and authentically connect to ourselves, to listen to our bodies (I talk about this in my book “Cravings Boss”), our hearts, out intuition. Can you just imagine the possibility of being able to understand your own needs and tend to them guilt-free.One of the ways to connect deeper is meditation. You don’t need to do much, just some deep breathing to start. I’ve seen so much research on what it does to the brain, and with consistent practice the results are remarkable.I like to do 2-3 mini check-ins throughout the day, just asking myself how I feel and what I need to feel more energized.